We've described the Swedish method of building off site in several past blog posts, but today we will take a closer look at the assembly line to get a better idea of how you build walls this way. The first thing I have to explain is that a fully automated line like this is not needed to build houses the way they do in Sweden. In fact most of the small factories do not have these complex machines, and are using a simpler process, more manual, less automated. But what they both have in common is a reduction in wasted effort, a lean process of building. In the next few days we'll also look more closely at how they build without all this machinery. But first this machinery. 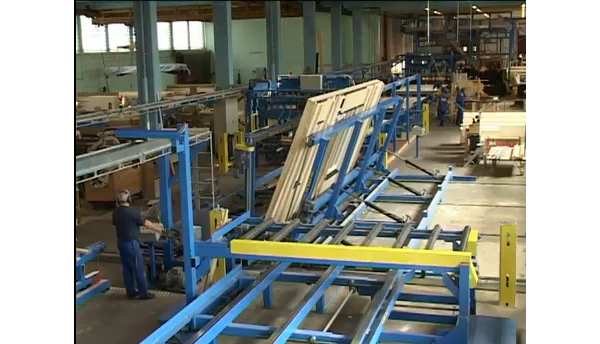 The Swedes build wood houses in a particular way, and so a Swedish company named Randek Bautech builds machines that automate the way the Swedes build houses. They can't expect a German company or a Japanese company to do this, so they invent their own. Makes perfect sense. What exactly do I mean by that though? Well for instance the Swedes use solid wood siding when they use siding on their houses - not vinyl as common in the US. 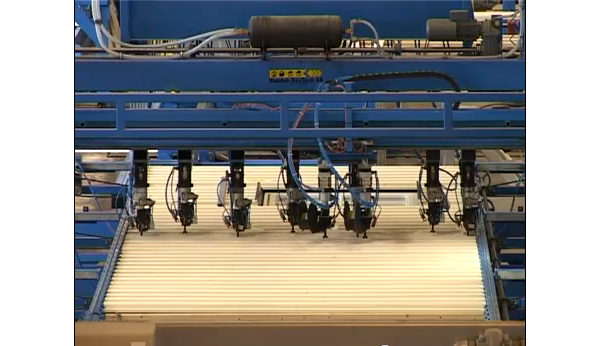 So they create a machine that can nail their solid wood siding. Obviously this would not have much use for a large US builder who primarily uses vinyl siding. Ok, got it? 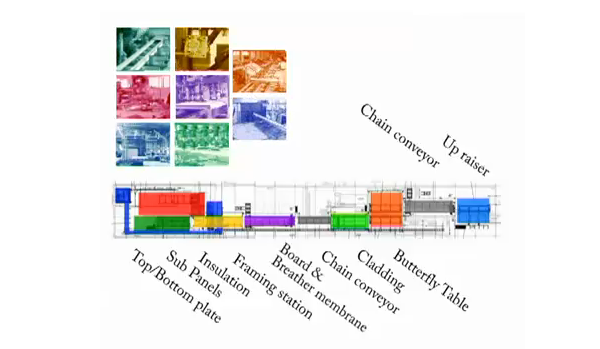 - indications of chain conveyors are areas where the wall panels are transferred between stations and some manual portions of the work are completed. - finally the up raiser is the machine that stands the panel on end so it can be conveyed to be wrapped and loaded on the truck. Lets look at some stills of each step now. This is the sill plate being formed. It is in two parts bridged by a thin panel - this is because it sits on top of a center plate that is pre-attached to floor, so the wall panel aligns itself when placed. This makes sense because your precision happens when you nail the center plate to the floor - easy, not when a 2000kg panel is dangling from a crane - not easy. 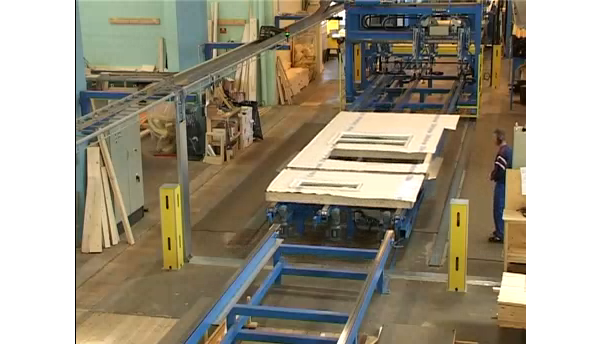 Here is the sub-panel station, where we see a window being installed into the framed opening. Yes, that's right, the window is installed before the wall is even framed. This whole assembly will then find its place in the line of studs making up the given wall. 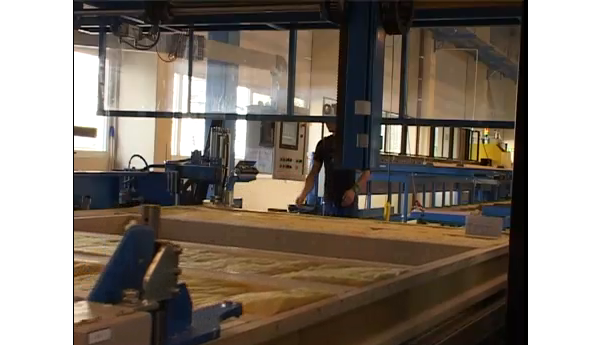 This machine unrolls the insulation batts, and cuts them to fit the spaces coming in the wall panel. One of the worker will tamp them in to be sure they are positioned correctly. The framing station where the plates and wall studs are joined - now you have a panel. This is where the wall sheathing is cut and applied, and the wall wrap put on the exterior. 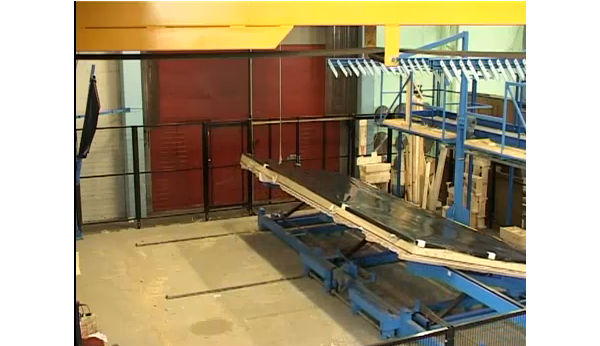 From here it enters one of the transfer sections where battens are applied for the upcoming siding. 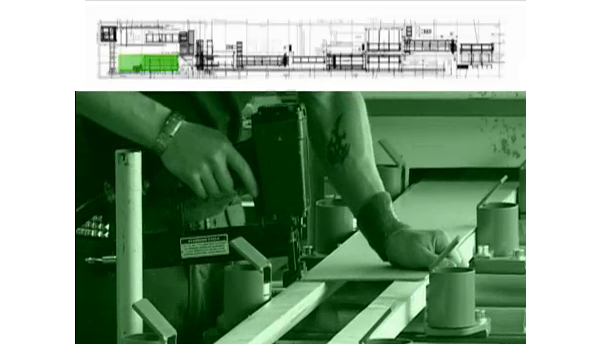 Here the siding panels are automatically nailed to the wall panel over the battens. Each of those nailing lines are following a batten line, with additional nail lines positioned over and under the window to fasten the ends of these short boards. The flip table makes short work of turning over a large wall panel so you can work on the other side. Now the interior air barrier can be fastened. 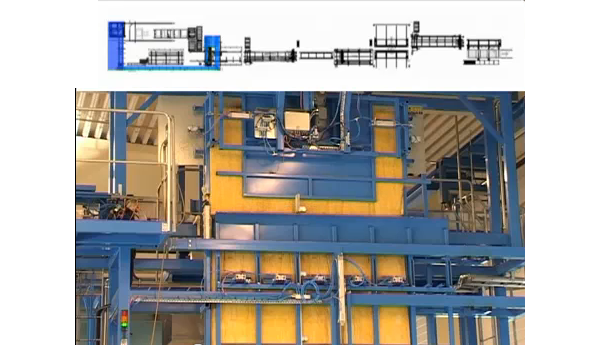 In the video the line stops there, but the transfer area here can also be used to fix interior battens, electrical boxes and wiring conduits, and finally the interior gypsum board. And finally the wall panel is stood on end, passed by cart to the next worker who will wrap it and then stow it in a rack, and eventually loaded on the truck for delivery. Two items: I hate batts. 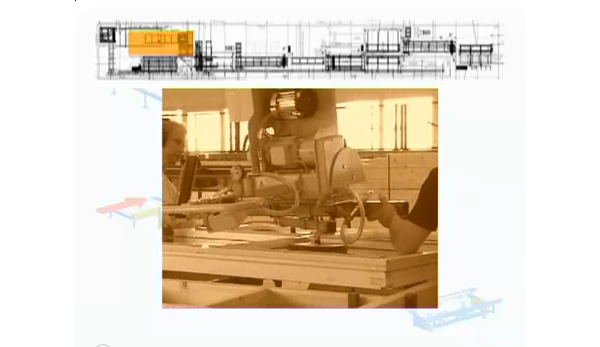 I'd prefer to see sprayed urethane or something similar, and with the level of automation that they already have implemented, it'd be a no-brainer to have the hardware installed into the current process line, even if a trimmer station is added for the overage. Second item is panel depth; it would appear to be about the same as our nominal 6", or in metric dimensions, about 150mm.? That's good, as I know my house is framed only with 2x4 studs, and I'd appreciate having the extra insulation in my rather extreme weathering environment. As always, thanks and good work on getting these kinds of vids and articles posted. Ok, first - batts there are not fiberglass. Its mineral wool, higher density than our batts, more insulation value. Second, studs are deeper than 6" full in most cases, and sometimes are supplemented with another layer of insulation outside or inside. Third, the wiring is all run in the furring space, so there are no penetrations of the vapor barrier, and there are no voids in the batts. They have as full and dense an installation as we try to get here with blown in or spray foam, but guess what. Its cheaper to use batts, and so everybody can afford a highly insulated house. So there is nothing wrong with batts, what is wrong is the way we build with batts in the US. thats about 7.5" deep - closer to our 2x8s. That may not be what we see in this particular video. With their denser insulation you can get what I expect is close to an R30 batt in that wall. Thermal bridging will reduce that and is sometimes mediated by an external insulation layer, but its a pretty high performance wall they build. They look about 200mm wide to me definitely more than 6 inches. It is. After blathering about it for so long its nice to see it in an easy to understand presentation. Does this mean that they have an inventory of walls? You pick a particular design and through standardization they can assemble a building practically right there because of prebuilt assembly? No, no inventory of built walls - that product sitting idle would be inefficient. Instead, its all built to order as needed for customers. XHouse3 - Construction Prints Done!